The OMID Foundation London Fundraising gala took place on Saturday, April 21 2018 at leading auction house Christie’s in the run up to London Islamic Week. This made for the perfect setting and pinpoint timing to ensure the success of OMD’s first London Gala. More than 190 guests attended this sold out event. To start a champagne reception took place, enabling guests to arrive in style and comfort and view the lots on offer in the live and silent auction parts of the evening. Our guests mingled and studied some great works of art by Salar Ahmadian, Reza Aramesh, Navid Azimi Sajadi, Shahrzad Changalvaee, Henry Dallal, Behnaz Ghasemi, Chakavak Ghayoori, Abbas Kiarostami, Akim Monet, Tarlan Rafiee, Mohammed Sami, Bert Stern and Gizella Varga Sinai, which had been kindly donated to OMID and were offered for sale in order to raise funds. The silent auction began and when all guests had taken their seats, William Robinson (Head of World Art Group, Christie’s) gave a speech on the importance of having OMID present just before the start of London Islamic Week. Marjaneh Halati, Founder of OMID then gave an annual report about OMID’s achievements and future plans. Her overview of OMID’s important work in empowering disadvantaged young women in Iran and some of the stories she shared moved many guests to tears. She thanked many key supporters and volunteers for making the evening’s event possible. Soon after the live auction conducted by Hugh Edmeades of Christie’s of London, commenced. Starting bids were surpassed on the night through the sale of exclusive paintings and photographs. Pledges were also made to raise funds for tuition fees, scholarships and vocational training for 20 young women in the OMID program. So fast was the biding the total target was surpassed in under ten minutes. Dinner was accompanied with live music as the silent auction continued. The silent auction raised substantial additional funds also, to round off a successful evening of fundraising beyond all expectations. Christie’s for hosting the event and William Robinson for his introduction. JAMM for donating a substantial number of works of art. 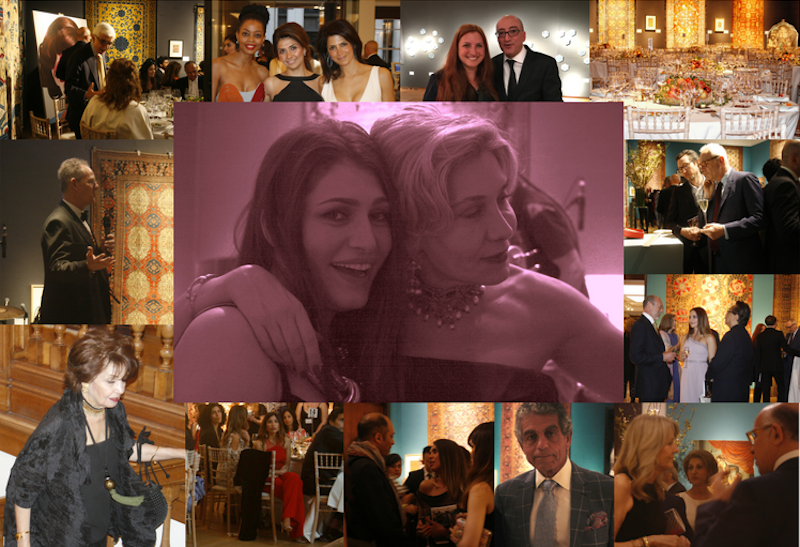 Azadeh Akbari (manager), Lulu Al-Sabah (art-curator), Shahrzad Atai (chair), Henry Dallal, Parvaneh Lari (catering), Nima Naghibi (vice-chair), Roya Rahnejat, Reza Shaybani, and Nilu Zargham (graphic design). Hasty Fard, Samira Farzadi, Aliyar Gazeranchi, Mohammadyar Gazeranchi, Katie Howard, Julianna Hsinchi-Huang, Shiva Mahmoodi, Katayoun Mohazeb, Polina Musurivschi, Elnaz Naseri, Ramona Niroomand, Clara Nordin, Sevil Zadeh, Zahra Zare. Reza Aramesh, Arts Club, Colbeh Restaurant, Navid Azimi Sajadi, Henry Dallal, Fielding and Nicholson, Chakavak Ghayoori , Christie’s, Home House, JAMM, Kateh Restaurant, Kay International, Maryam Khosrowshahi, Knightsbridge Advanced Beauty, Kolbeh, Parvaneh Lari, Lucio Restaurant, Nicky Clarke Salon, Tarlan Rafiee, Reza Shaybani, River Café, Gizella Varga Sinai, and Zafferano Restaurant. And for special attention to detail on the night thank you Maryam Khosrowshahi for the lovely table centrepiece arrangements, and Lottie Wolstenholme of Christie’s event management. Most importantly we would also like to thank everyone who bought a ticket, donated in lieu of not being able to attend and donated via our auctions and pledges. Your generosity has made so much more possible for the young women at OMID.